TheBloomOutlet.com | Chinese New Year is one festive season that is worth to be celebrated. This is the time to spread cheer, happiness, and joy altogether. 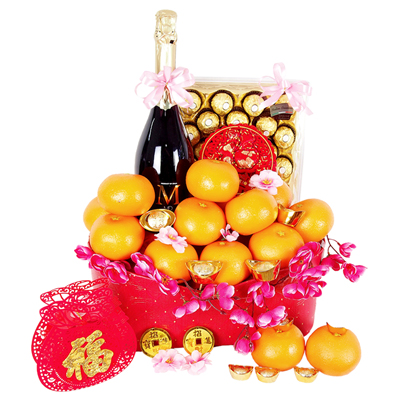 And one of the best ways to do that is by sending or arranging for a flower delivery Singapore of Chinese New Year gifts. What is a celebration without gifts, after all? A gift is the one that will make a celebration like Chinese New Year become more exciting. Besides, the gift will strengthen or grow the relationship between the giver and the receiver; this is definitely important to create a good relationship and show the receiver that you care and wish them the best on Chinese New Year. Flowers are a good gift for almost every occasions in life, including Chinese New Year. Giving a basket of beautiful flowers is a beautiful gesture to wish a happy Chinese New Year. Flowers have meaning, that’s why they are good to express your good wishes. You can choose the flowers in the most suitable meaning here and let the recipient know. Hydrangeas, Peonies, Chrysanthemums, and Orchids are the most popular choice for the Chinese New Year flower. Besides flowers, chocolates are the all-time-favorite gift too. Chocolate also synonymous with celebration, love, and happiness. Almost everyone would love to receive chocolate as a gift. The sweets of chocolate can be a sweet expression not only for love but also for good fortunes on Chinese New Year. Chinese New Year basket of chocolate will never go wrong in pleasing the receiver, though. Who doesn’t like fruits? Not only sweet and delicious, but fruits are also good for health; they are rich of nutrients, minerals, and vitamins which are good for our body. No one will resist this kind of gift and surely will appreciate it. Other than chocolate and fruit, you can also choose to fill in your Chinese New Year basket gift with other edibles such as biscuits, cheese, nuts, honey, caramels, etc. Gift baskets are simply something that can make anyone feel delighted to receive it. A gift basket also a kind of gift that is appropriate to give to the whole family (not only for one person) since there can be more than one stuff in the basket.